TOKYO – Toyota Motor Corp.’s operating profit surged 43 per cent in the latest quarter as cost cutting, lower selling outlays and falling warranty expenses offset unfavourable foreign exchange rates and helped pilot Japan’s biggest automaker to a record full-year net income. Operating profit rose to 629.6 billion yen (US$5.93 billion) in the carmaker’s fiscal fourth quarter ended March 31, while net income advanced 21 per cent to 480.8 billion yen (US$4.53 billion). Revenue rose 1.9 per cent to 7.58 trillion yen (US$71.36 billion). Global retail sales increased 2.2 per cent to 2.6 million vehicles in the January-March period, including results from its Daihatsu small-car subsidiary and truck-making affiliate Hino. Worldwide wholesale volume declined 1.8 per cent to 2.3 million. In announcing the earnings results May 9, Executive Vice President and CFO Koji Kobayashi credited companywide cost control and restraints on spiffs and marketing expenses for the uptick in quarterly profit. Results were also lifted by a 145 billion yen (US$1.37 billion) thanks to lower outlays on quality-related issues such as the recall of faulty Takata airbags. Foreign exchange rates dragged on Toyota’s fourth-quarter earnings. The Japanese yen’s appreciation against the U.S. dollar and other currencies lopped 30 billion yen (US$282.4 million) off quarterly earnings. But that was offset by cost cutting of 30 billion yen (US$282.4 million). North America booked an operating loss of 38.8 billion yen (US$365.3 million) in the January-March period. Red ink was reined in from a loss of 70.7 billion (US$665.6 million) the year before. But North American operating margin still amounted to a meager 1.3 per cent for the full fiscal year ended March 31. Kobayashi said Toyota wants to boost that to 8 per cent by 2020. Wholesale volume in North America declined 2.5 per cent to 675,000 vehicles in the quarter. Cars made up just 32 per cent of total U.S. sales in the first three months of the year. But at Toyota Motor Sales U.S.A., which covers sales of both the Toyota and Lexus brands, cars accounted for 40 per cent of the mix. Toyota Canada’s earnings are part of the automaker’s North American total and not reported separately. Total Canadian sales were up 3.9 per cent in the quarter. The automaker builds the Toyota Corolla and RAV4 and Lexus RX 350 and RX 450h at three Ontario assembly plants. Toyota plans to wind down Corolla production and replace it with more production of the RAV4 to meet U.S. demand for the utility vehicle. Toyota said this month it will spend about C$1.4 billion (US$1.1 billion) upgrading two of its three Ontario assembly plants in order to build the next generation of the RAV4 crossover. Toyota has high hopes for the fifth-generation version. Last year, the RAV4 was the best-selling vehicle in the U.S. that was not a pickup truck, with sales of more than 400,000. Toyota has also been helped by lower spiffs on some nameplates, such as the redesigned Camry. 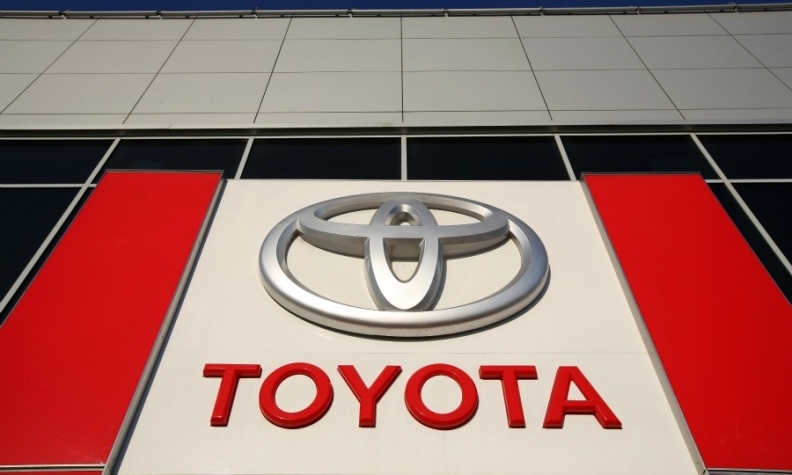 But Toyota Motor Sales’ incentive outlays still rose 5.6 per cent to US$2,451 per vehicle in the first three months of 2018, according to data from Motor Intelligence Corp.
Its increase was in line with the overall industry’s 5.8 per cent advance, but Toyota’s average outlays were below the industry average of US$3,746 per vehicle. Toyota’s European business was back in the black in the fiscal fourth quarter, posting regional operating profit of 13.8 billion yen (US$129.9 million), from a regional loss of 64.9 billion (US$611.0 million) a year earlier. European wholesale shipments rose 1.9 per cent to 262,00 units. Toyota is fighting unfavourable exchange rates and plateauing demand in its biggest market, the U.S., where the maker of the Camry and Corolla sedans has been slow to react to the customer stampede from cars to light trucks. At the same time, it is racing to ramp up business in China and clamp down on costs to channel funds into next-generation technologies. Earlier this year, it channeled out US$2.8 billion to create another new company, Toyota Research Institute – Advanced Development, to develop the software that runs self-driving cars. For the full fiscal year ended March 31, Toyota’s operating profit increased 17 per cent to 2.40 trillion yen (US$22.59 billion), from 1.99 trillion yen (US$18.73 billion) a year earlier. Net income jumped 27 per cent to a record 2.49 trillion yen (US$23.44 billion) from 1.83 trillion yen (US$17.22 billion) the year before. U.S. tax breaks, which reduced the corporate rate to 21 per cent from 33 per cent starting Jan. 1, helped pump up the net income for the full year. Revenue also reached a new all-time high, increasing 6.1 per cent to 29.38 trillion yen (US$276.60 billion), from 27.60 trillion yen (US$259.84 billion) a year earlier. Wholesale volume dipped just a hair to 8.96 million vehicles, from 8.97 million the year before. Retail sales increased 1.9 per cent to 10.44 million vehicles, from 10.25 million. Still, looking ahead, Toyota predicted operating profit would decline 4.2 per cent in the current fiscal year ending March 31, 2019, undermined by a deteriorating foreign exchange rate. Net income is seen 15 per cent lower, without the year earlier one-time gain from U.S. tax reform.